The 10th century saw the development of three Slavonic language groups – Western, Southern and Eastern. Eastern Slavonic soon developed into what we know today as Ukrainian, Belorussian and Russian. The three language groups used one common written language – Old Church Slavonic. It was in the 9th century when the Cyrillic alphabet was introduced by missionaries, Cyril and Methodius. In Russia, Old Church Slavonic was the official written language until the 18th century when a new written language developed based on the educated spoken norm. The three language styles, High Style, Middle Style and Low Style were introduced by the famous M. V. Lomonosov. With features of East and Church Slavonic, the Middle Style is in fact what helped form the foundations of the modern standard language. It was in the 19th century when Standard Russian, based on the Moscow dialect became the official language. Russian is the largest and most spoken Slavic language and it is the 8th most popular language in the world. There are approximately 170 million native speakers while another 113 million speak it as a second language. It is spoken in countries including Russia, Belarus, Kazakhstan and Kyrgyzstan and it is considered an unofficial lingua franca in countries including Ukraine, Azerbaijan, Estonia, Georgia, Latvia, Lithuania, Moldova, Tajikistan, Turkmenistan and Uzbekistan. Belarus, Kazakhstan, Russia, and Ukraine all use the same Russian written language so there would be no need to hire separate translators for each! 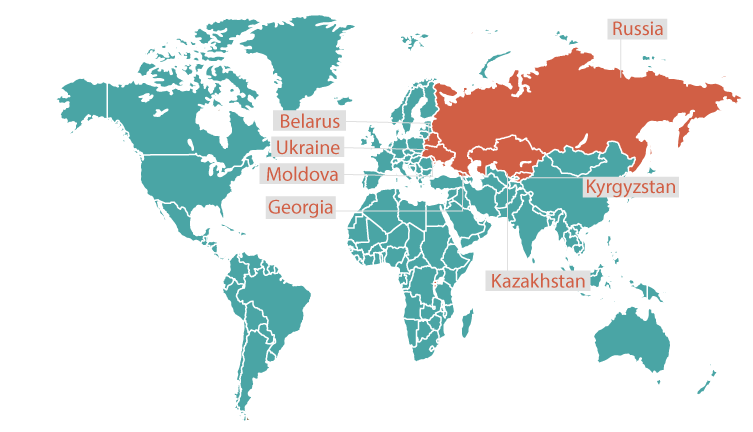 However, these Russian-speaking countries may have different pronunciations of the language. The Cyrillic alphabet is very similar to the Greek alphabet but with around a dozen extra letters to represent Slavic sounds that the Greek language does not have. Over 850,000 Americans speak Russian! • Keep in mind that the letter ‘w’ only appears in foreign words within the language. • Look out for false cognates – “attendre” doesn’t mean “attend”, it means “to wait”. and pronunciation of nasal sounds. • Get used to linguistic rules such as replacing “ly” in English to “ement” in French. • Avoid using general words like “très” or “choses”. • Try not to use the passive voice unless it’s totally required – this is quite rare in the French language. Russian words are similar to English! But some words are very different to English although they look/sound the same! There are only about 200,000 words in the Russian language. • Russian nouns have 12 variations depending on how they’re used in a sentence. There are also many Russian verbs whose endings depend on tense, gender, mood, and amount. • Know your audience – Russian translates differently depending on whether you use formal or informal registers. • Watch out for punctuation – Russian uses chevrons («») as quotation marks and the “ symbol isn’t used at all! Also, the dollar sign is placed after numbers! • The average Russian word contains 7.2 symbols, while the average English word contains 5.2 symbols – Russian translations will usually grow by 20% in character count so always allow more space! • Native Russian words hardly ever start with the letter “A” except for a few like азбука (alphabet) and авось (perhaps). • The way you order words doesn’t really matter in the Russian language (in terms of grammar). Are you looking for high quality Russian translation and localization services? Get in touch with Pangea! We’ll hook you up with one of our professional linguists who will provide you with accurate and reliable translations.